ANY existing (landline, mobile, or VoIP) telephone. 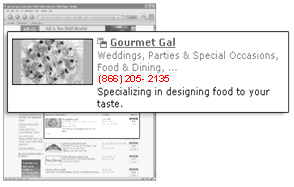 and / or local numbers for their advertisers’ listings. than 90% of the major metropolitan areas of U.S.
caller-id and enhanced caller data. Copyright (c) 2003-2009 CIRXIT, Inc. All Rights Reserved.